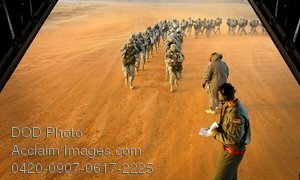 Description: Free, public domain image: Army Paratroopers Boarding a C-130 Hercules Helicopter . U.S. Army paratroopers prepare to board a C-130 Hercules aircraft during Operation Toy Drop 2007 at Pope Air Force Base, N.C., Dec. 8, 2007. The 10th Annual Randy Oler memorial Operation Toy Drop hosted by the U.S. Army Civil Affairs and Psychological Operations Command (Airborne) is a foreign wings exchange and community service operation to support the military and local in the Fayetteville area. (U.S. Air Force photo by Senior Airman Clay Lancaster).